What problems are related to dental implants? Dental implants are mainly used to replace a single missing tooth, which, in most cases, is a premolar or a molar tooth. Tooth decay, failed root canal treatment and cracking are some of the reasons that a tooth may be extracted. Front teeth, or incisors, are lost less frequently than molars. However, a missing incisor reduces a patient’s ability to chew and is also an aesthetic problem. A single missing incisor can be replaced with a dental crown that is built on top of an implant. Dental implants are a suitable option for most adults. However, implants are not recommended for children and adolescents, whose jaws have not stopped growing. This growth slows down after the age of 22. Dental implants are not used for children and adolescents because their jaw may grow, but the implant will remain in a fixed place. If the jaw around the implant continues to grow, the implant may be left in an unwanted position. Dental implant treatment includes surgical procedures; the patient’s general health and medications may affect the treatment. Diseases that weaken the body’s immune system, such as diabetes, affect wound healing and can increase the risk of implant complications. General illnesses are usually not an obstacle to receiving dental implant treatment. However, their effect on the treatment outcome has to be evaluated. Some medicines, such as cortisone and cytostatic drugs, affect the body’s immune system and increase the risk for implant treatment complications. A commonly used osteoporosis medication (bisphosphonate) can also create additional problems after oral surgical procedures. Radiotherapy to the head area, for example during cancer treatment, can present challenges for implant ossification. Therefore, patients who have received radiotherapy are given hyperbaric oxygen therapy before implant treatment, and implant placement is often performed in a hospital setting. Smoking is a significant risk factor for implant failure. Heavy smoking increases the risk for ossification and connective tissue problems. Cutting down or quitting smoking improves treatment outcome. Dental implants are not suitable for patients with untreated oral infections. Untreated periodontitis, in particular, is a considerable risk factor for treatment failure. 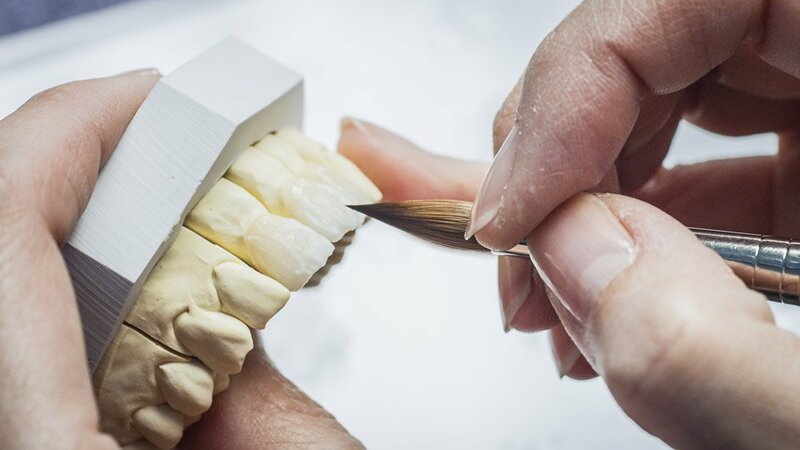 First, the patient’s mouth is examined in order to review the performance of the jaw joint and masticatory muscle and to check the bite, oral mucosa, teeth and gums. Oral diseases such as caries, gingivitis and tooth or tooth root infections are treated, and damaged teeth are removed before implant treatment is started. Dentists may also pay attention to the patient’s oral hygiene, including brushing and flossing, and give additional instructions. Plaster models are used both to examine teeth positions and occlusions and to plan optimal implant shapes and positions. A dentist takes X-rays and uses them to plan the implant treatment. In addition to plaster models and X-rays, computer programs can be used to plan the treatment. 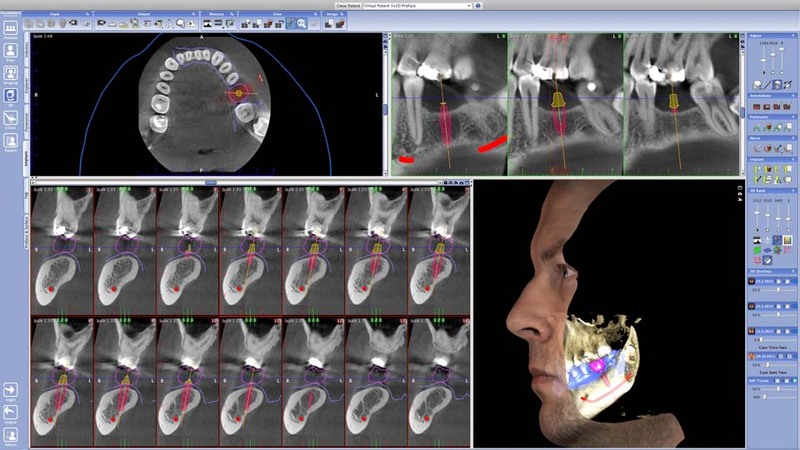 Cone beam computer tomography provides a 3D model of the patient’s jaws, which allows for different implant lengths and sites to be tested. Depending on the prosthesis, different work phases can be tested to ensure that the shape of the prosthesis is correct and that it sits accurately on the implant. A dental technician fabricates a dental prosthesis, such as a dental crown, and places it on the implant. Aesthetic factors are particularly important when a prosthesis is made to replace an incisor. Osteoporosis, diabetes and smoking can cause ossification problems. Certain medicines, such as cytostatic drugs and cortisone, can also increase the risk of ossification problems. Replacing a single missing tooth with dental implant costs 1799 euros. If more than one missing teeth are replaced, the cost is about 1000–1700 euros per replaced tooth. We provide 5 year full guarantee for dental implant treatments. We realize that most people feel anxious about a visit to the dentist, so we do our best to make you feel comfortable, in a relaxed informal atmosphere. From the smallest filling to solving complex dental problems, you will always find a sympathetic ear. We start by getting to know you and helping you overcome any worries you may have about dental care. Our aim is to discover your own particular dental needs and help you keep all your teeth, all your life. The consultation visit lasts about 15 to 30 minutes, during which you will receive answers to your questions as well as a preliminary treatment plan and a cost estimate. Find more about free consultation and contact information. Chrcanovic BR, Albrektsson T, Wennerberg A. Reasons for failures of oral implants. J Oral Rehabil 2014;41:443-476. Han HJ, Kim S, Han DH. Multifactorial Evaluation of Implant Failure: A 19-year Retrospective Study. Int J Oral Maxillofac Implants 2014;29:303-310. Jung RE, Zembic A, Pjetursson BE et al. Systematic review of the survival rate and the incidence of biological, technical, and aesthetic complications of single crowns on implants reported in longitudinal studies with a mean follow-up of 5 years. Clin Oral Implants Res 2012;6:2-21. Misch CE. Contemporary Implant Dentistry, 3rd edition. Elsevier 2007. Özkurt Z, Kazazoğlu E. Zirconia dental implants: a literature review. J Oral Implantol 2011;37:367-376.